Chances are you SHOULD NOT GO SWIMMING TOMORROW, EVEN AT THE POOL. Your hair, if not dried completely, will get all frozen when you walk out and you will look like Doc Brown. At some point, dry thirsty hair will bite back by shocking you with static electricity which could kill you, when and if it is the form of lightening, so LOOK OUT! Your lips will get incredibly chapped. DON’T LICK THEM! Your tongue may stick to them, no just kidding. Slather on the lip balm which your grocery and drug store will run out of in 35 minutes from this posting. Also your legs will itch uncontrollably and you WILL break out in a weird rash of red bumps on your torso. I would show you a picture of my cold weather rash but it is all gone because it is a balmy 32 degrees and snowing here in Anchorage. Slather on the moisturizer or shortening or lard if necessary. Do not go to the emergency room. This is not Shingles. The freezing point is the weather we prefer here. It is perfect. You will soon agree. Although 20 degrees is better for ice skating which is only done outdoors here. If you go ice skating in minus 20 degrees F, as I have done on occasion, you may find your nose is running and wipe it on your mitten. Only you will find blood all over you as your nasal membranes may burst. This is not a medical emergency, just poor judgement. who in term attributed it to The National Weather Service in Des Moines, Iowa. I combed through the NWS Iowa site and saw no mention of silence or walking backwards while throwing salt over your shoulder in order that the POLAR VORTEX shall not strike you dead with its Mighty Ice Scythe. As far as not breathing deeply outside, you can accomplish that easily by inducing a panic attack which involves shallow breathing. Start thinking about Trump or your retirement account, what’s left of it, or your diet before going outside. Panic is your friend. Remember if you turn blue, faint and break your head open it probably isn’t from the cold but from your lack of breathing. God forbid you wear a scarf or face mask. JUST DON’T TALK. THE POLAR VORTEX STALKS PEOPLE WHO TALK! JUST SHUT UP FOR GODSAKES AND LIVE TO TALK ABOUT IT! Here’s some more unsolicited advice from Alaska. DO GO OUTSIDE! IF YOU DO NOT, EVERYONE FROM WORK WILL HAVE A STORY ABOUT HOW COLD IT WAS BUT YOU AND YOU WILL HAVE NOTHING TO TELL YOUR KIDS WHEN THEY COMPLAIN ABOUT HOW HOT IT IS THIS SUMMER. Best to walk to the store and buy some ice cream. That is something to be able to write on your tombstone. which is traditionally used indoors. In Alaska we do tend to wave conversations inside when it gets too cold. We wear layers or if you are pretentious you buy high tech polar clothing even if you don’t work outside. We plug in our cars and the people with the high tech polar clothing have remote car starters and seat warmers. Most adults go outside each day no matter how cold it is because we are insane but recess is cancelled because little children don’t know how to slow down in the cold. We don’t do marathon training in that kind of weather but we also don’t call in sick from work or people will laugh at us. People have been know to go camping in minus twenty and sleep in snow shelters for fun. 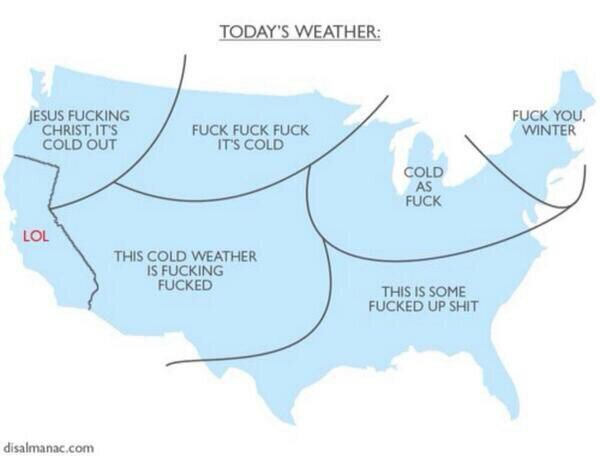 Enjoy your POLAR VORTEX. Don’t die. Don’t stop breathing and remember that silence won’t save you. THE POLAR VORTEX CAN READ YOUR MIND! Alsoif you do happen to get the day off, consider pairing with a co-worker and driving to the store or foodbank or just to a local bus stop and offering folks a ride home or wherever. It will warm your heart if nothing else. Posted in Uncategorized and tagged Alaska, anxiety, disaster, fake news, humor, panic, polar vortex, satire, weather, winter preparedness. Bookmark the permalink.